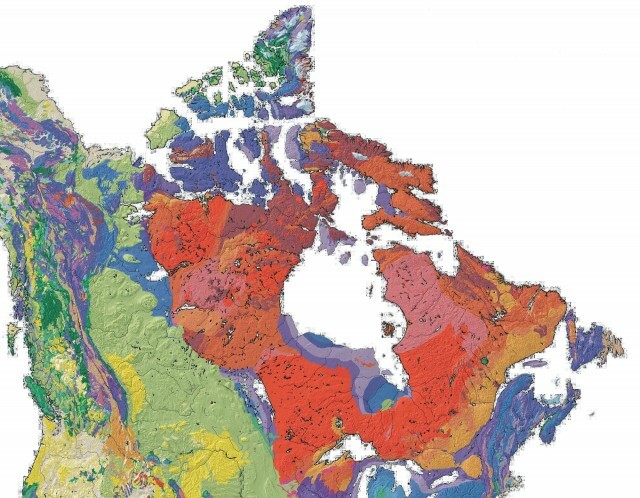 THE CANADIAN or Laurentian Shield, the largest natural region of North America at 1.1 million square mi (3 million square km), is located north of the St. Lawrence Lowland and east of the Interior Plains. It is composed of igneous and metamorphic rock of Precambrian origin, some of the oldest rock on Earth. More than 80 percent of the surface is exposed gneissic granite, basement rock at the surface, the product of intense glacial action and erosion over the past half billion years. Glacier ice scoured the rock and sculpted river valleys, dragged and laid down boulders called erratics, and severely disrupted the surface drainage pattern. The shield is largely devoid of soil and dotted by hundreds of thousands of swamps, lakes, rivers, and streams. The shield is stable continental crust gently rolling in character (under 2,000 ft or 600 m) with occasional prominent uplifts of crustal blocks. One sees the sharpest local relief along the southern edge, especially the Laurentide Escarpment in Quebec. The shield exhibits a bowl shape as it slopes gently northward to Hudson Bay. Glacial debris has been deposited in river valleys and lowlands to considerable depths, such as around James Bay and Hudson Bay, giving the landscapes a notable flatness. Long, cold winters and short, cool summers characterize the region. Though primarily rock, water, and ice, the shield also hosts a vast boreal or softwood forest of spruce, fir, pines, and tamaracks, tall and dense in the south to short and sparse in the north. Soils are poorly drained, acidic, and thin, and therefore of limited value to agriculture. These soils are mainly spodosols, associated with evergreen forest, while the northern TUNDRA soils are heavily moisture laden and frozen for much of the year. Fertile soils are limited to a few river valleys where deposition has been significant. The shield effectively divided eastern and western CANADA and posed a major barrier to westward migration. The Hudson’s Bay Company created a trade monopoly across the region and laid the basis for a network of extractive industries. Settlements today are mostly small, widely dispersed, have narrowly based economies based on extractive industries such as mining, and are controlled largely by the urban-industrial core to the south. Sudbury, Ontario, at 160,500 is the largest metropolitan center in the region, followed by Thunder Bay, Ontario, at 125,000. Inuit and native populations are well represented on the shield, although in scattered locations, and the population in general faces limited economic opportunities, unemployment, and related social problems. The shield has figured prominently in the development of Canadian character and culture, as evidenced in everything from art and music to the stories of Jack London. Metallic ores are concentrated in an arc between the North ATLANTIC OCEAN, ST. LAWRENCE RIVER, and the Arctic as, for example, nickel at Sudbury, copperlead-zinc at Flin Flon, and iron ore on the Quebec-Labrador border and in western Ontario. Access is a critical issue, especially for extractive industries like mining and lumbering that depend heavily on overland transport. Construction costs are high over vast distances of rocky, ill-drained surfaces where population densities are low. Railroad lines extend from the Prairie Provinces to Churchill on Hudson Bay as well as to mining developments on the Great Slave Lake, Northwest Territories, and to James Bay in Quebec. Helicopter and small plane services are integral to the region. All in all, transportation networks are not well developed, and communities face ongoing problems of isolation, high costs, and uneven integration into the Canadian economy. The shield holds great hydroelectric potential, especially along its southern edge where local relief is most abrupt. Power stations at Churchill Falls, Labrador, and James Bay, Quebec, are the shield’s two largest hydroelectric developments. Power is abundant, sold to markets in the northeastern UNITED STATES, and important as cheap energy for aluminum manufacturing, lumber processing, and other shield industries. Intimate functional relationships have grown up between the resource areas of the shield and the processing industries of the St. Lawrence Valley. Tourism is a fastdeveloping industry, especially on the southern margins, and is accompanied by growing public concern over preservation of the fragile shield environment.